MELVILLE, NEW YORK , April 26, 2017 (Newswire.com) – A strong organization can generate up to 70% more revenue than an average organization based solely on the quality of its data, according to SiriusDecisions. Without clean data, a business can never fully leverage or recap investments on Salesforce and Marketo. Recognizing the industry’s need for real-time duplicate prevention, RingLead today announced the only software capable of integrating with Salesforce and Marketo to prevent duplicates in real-time from all data sources. Duplicate data is time-consuming and expensive for all. Bad data results in inaccurate lead scoring, inefficient marketing and sales campaigns, and lost revenue and opportunities. 1 in 3 business leaders don’t trust the data they use to make big decisions about strategy and investment. DMS ensures data quality by employing over 55 custom matchers and merge rules to prevent duplicates from lists, web forms and manual entry. The power to fully customize match and merge rules gives users complete confidence in DMS’ ability to prevent duplicates and merge records in a manner that preserves the most valuable data. DMS Duplicate Prevention relies on three key tools: List Import, Web Submissions and Unique Entry. · Web Submissions prevents duplicates from entering a database through Marketo or Salesforce web forms while also enriching any blank fields with company and contact data. · List Import allows users to upload and enrich large lists within seconds without creating a single duplicate. · Unique Entry uses as-you-type alerts to notify users in real time if they are creating a duplicate, allowing users to edit the original record rather than creating a new lead. RingLead DMS Duplicate Prevention is not the only software to promise real-time duplicate prevention, but it is the only software to deliver. 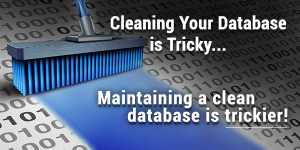 Similar products serve as real-time cleansing tools that continuously scan a database to catch duplicates and perform merges. By the time a duplicate is detected, a series of unwanted triggers and workflows have already been set off. RingLead doesn’t let the duplicates in. Period. DMS is slated to integrate with several other marketing automation systems including Pardot and Eloqua this year. For a free duplicate analysis, and a free dedupe of 2,500 records, please click here. RingLead, Inc. is the fastest growing SaaS company on Long Island. RingLead offers a complete end-to-end suite of products to clean, protect and enhance company and contact information. Since 2003, RingLead has helped solve the dirty data problems of thousands of enterprises, Fortune 500 companies and small businesses across the globe.